The 13th edition of the Delhi Auto Expo kicked off at the India Expo Mart (IEM) in Greater Noida on Wednesday, with brands from over 20 countries showcasing various cars, bikes and automobile trends. The first two days of the expo is open to the media and business visitors and it will be open for the public during February 5-9. 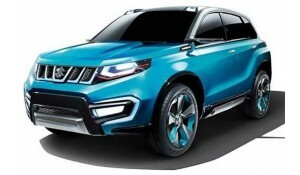 The expo kicked off with the country’s largest carmaker Maruti Suzuki India unveiling its new compact SUV Vitara Brezza. Some of the big-ticket launches include Hyundai’s Tucson, Mercedes Benz’ sports utility vehicle GLC and S-Class Cabriolet,Toyota’s Innova Crysta, BMW’s X1, Honda’s BR-V, Hyundai’s HND-14, ISUZU’s D-Max V crossover and Jaguar XE sports saloon among others. The two-wheeler segment also saw some activity with Honda unveiling the 110 cc Navi, Hero MotorCorp with their first in-house motorcycle iSplendor 110, Suzuki’s Access 125 and Piaggio’s two-wheeler crossover Aprilia SR 150 etc. ..
Renault has unveiled the latest version of its best selling compact SUV the Duster at the Auto Expo 2016. .. This is Suzuki's special concept car for the 2011 Tokyo Motor Show - the Regina. Now, Maruti and Suzuki have a close relationship and almost every small car from Suzuki has always made it to the Indian market and this is where the Regina holds importance for the Indian market. So, will we see Maruti Regina selling in India is the big question! ..
Hyundai hasnt done wonders with their premium offerings in the Indian market. Their vehicles like the Elantra, Sonata, Tucson, Terracan have died a slow death. However, the brand perception is changing fast and the company is keen on cashing on this - the all-new Tucson or the iX35 as it is called in the international market is the next vehicle for India in the premium segment. ..